The readers of the Arbeiter Illustrierte Zeitung were formally introduced to John Heartfield and his combative art of photomontage in the second week of September 1929-on page 17 of issue number 37, to be precise (fig. 7). Ceremonially clad in coat and tie as if dressed for a formal portrait, brow furrowed, fierce glare commanding the beholder's gaze, John Heartfield presented himself in the act of beheading the Berlin police chief, Karl Zörgiebel. The blade separating the police chief's head from his body was not the solitary edge of a guillotine, executing the condemned with a single merciful thwack, but the twin edges of long-handled shears, slowly decapitating the victim with a repetitive joining and separating, each gesture widening the gap between head and body, helped along by Heartfield's tugging fingers. I say "formally introduced" because the occasional Heartfield photomontage had appeared in this or that corner of preceding issues of the AIZ promoting the soon to be published book Deutschland, Deutschland über alles, a collaboration with the well-known writer Kurt Tucholsky. This endorsement was a practical arrangement, since the publisher of the AIZ and that of the satire was the same: Willi Münzenberg's Neuer Deutscher Verlag.Those earlier introductions to Heartfield's work were not particularly auspicious. Far from indicating Heartfield's popularity to come, the editors regularly misspelled his name-as Heartfieldt or Haertfield, for example-signaling not merely linguistic unfamiliarity on the part of the editorial staff but apparent artistic unfamiliarity as well. In the summer of 1929, Heartfield was overshadowed in the AIZ by Tucholsky, one of the most penetrating social critics of the time. Yet this declarative self-portrait and its showcase of his tendentious art would soon help transform this unfamiliarity into celebrity. Though twice framed in the picture by the slogan "Use photography as weapon! "-once above the self-portrait and once below, in an exclamatory headline and a sober undertitle-Heartfield's commanding and violent act makes us wonder whether the Monteur's savage scissors rather than the photograph serve as the actual weapon. Heartfield's shears declare their own deed, their long blades pointing to the abrupt border of the self-portrait, where the background cedes to the incursion of the adjacent exhibition photograph. "I did this," the shears seem to say, calling our attention to the retracted frame, the mutilated edges of Zörgiebel's chin, the discomfiting rift between his neck and shoulders. The conception of his 1929 guillotine-shears was apparently new. It is conspicuously absent from the array of scissors that Heartfield put on sardonic mail-order display two years previously in Schöne Be-Scherung (fig. 8). A pun on the word for scissors (Schere), the title Schöne Be-Scherung means either a plentiful bounty, often used to describe holiday gift-giving, or its ironic opposite "This is a fine mess." Although in 1927 scissors were understood as something to trim errant behavior-model no. 26, or "Gertrud," the montage announces, is ideal for reprobates, while model no. 27 is for trash-they are wielded by the state (either monarchy or new republic; the montage suggests they are continuous) against disruptive elements, and not, as in the case of the self-portrait, brandished by a citizen against a representative of that state. In September 1929, the artist asserted that this reversal was necessary. The laconic caption beneath the self-portrait, "John Heartfield with Police President Zörgiebel," names the actors but not the urgent action, an understatement that insists the work be apprehended in pictorial rather than textual terms. A paragraph penned by F. C. Weiskopf, a member of the AIZ editorial staff, fills the space inside the doorframe at the base of the page, but does little to expand on the action taking place above. Rather, Weiskopf broadly lauds the critical intersections of art and life, declaring Heartfield's art to be a weapon in class struggle, but without elaborating how. Language, in comparison to the exigency of the accompanying images, is curiously inadequate. As this chapter reveals, text regularly falls short of the various tasks for which it was recruited on page 17, issue #37, be they descriptive, explanatory, or hortatory. Notice that the abutting images are firmly located in an architectural space. As the caption in the upper right suggests, we are to understand them as photographic documentation of Heartfield's photomontages on exhibit at the Grosse Berliner Kunstausstellung. The self-portrait, however, occupies a liminal space created purely for the display of Heartfield's vicious artistic performance. Retracting here, extending itself there, the image competes for space among the other photographs, which are ostensibly documentary-testimonials that veridically reflect events outside the cognitive framework of the illustrated journal. The photomontage demonstrates, by contrast, its rhetoric of artificiality. John Heartfield manufactured his self-portrait specifically for this page, to be circulated in this Communist photographic magazine. It is an exhibit in and of itself-a show of Heartfield's technique, and a performance of his social identity as an artist as he conceived it in the year 1929. Heartfield's brother and collaborator, Wieland Herzfelde, once wrote: "John was already nicknamed the Monteur(assemblyman) during the war by his friends, not because of his working technique, but because he was in the habit of wearing overalls. He did not want to look like an artist, but he did not want to look like an adman either. "1 In his 1929 self-presentation, Heartfield traded in his supposedly habitual uniform-worker's overalls-for more "bourgeois" attire. Is the Monteur posing as gentleman executioner, perhaps, the traces of Dada-dandy subversion still manifest? Are these the props of a conventional self-portrait? Or was he appealing to both working-class and white-collar constituencies? That Herzfelde should choose the triangulation of industrial assemblyman, artist, and advertising professional is not fortuitous. During the Weimar Republic, many artists sought to fuse left-wing politics with commercial advertising and avant-garde aesthetics. Photomontage would play a central role in this combination. Certainly in the instance of the 1929 self-portrait, Heartfield was doing some advertising of his own: the image promoted the exhibition of his political photomontages at the Grosse Berliner Kunstausstellung. This often-reproduced self-portrait of John Heartfield has become iconic, functioning as a pictorial anchor for his artistic legacy. Appearing regularly on front covers and frontispieces of monographs, the image resonates throughout the reception history of his work. More often, it is presented in its pre-production mockup state, bearing Heartfield's clearly visible, penciled instructions to the production staff of the AIZ. Although reproduced more frequently than any other of Heartfield's photomontages, the self-portrait, as it appeared in 1929, has attracted little analytical attention. Instead, the self-portrait circulates in the economy of art historical images, a seemingly self-sufficient, ahistorical entity. Such dispersal of Heartfield's self-portrait, with its dehistoricization of the artist's image and its valuation of the marks of the artist's hand, stems from its utility in forwarding the cult of the artist (fig. 9). In its pre-AIZ incarnation, the image belongs to a now-familiar aesthetic category, easily accessible for a posterity in search of signifiers of artistic authenticity. We see physical traces contingent on the artist's presence: his script, his photographic likeness, and the jagged track of his incisive scissors. Relying on the posthumous reception of the preparatory mock-up, we might conclude that the montage was manufactured primarily for a life after John Heartfield's death, not conceived for a short-lived mechanical replication, as was in fact the case. As a document touted as representative-of the artist and of the artist's craft-the self-portrait has been deceptively dissociated from its discursive context, isolated from the other photographs with which it was published as if they were irrelevant to this moment of Heartfield's self-fashioning. The case is quite the contrary. As this chapter demonstrates, John Heartfield produced his militant self-portrait specifically to be disseminated on a page in a mass-market journal of the revolutionary Left, and he did so during a critical transition in Communist politics during the late Weimar Republic. One of the central tasks of this chapter is to elaborate upon what possible functions the 1929 self-portrait's ironic combination of aggression and attraction, self-assertion and subtraction could serve in the culture of late Weimar. Why did John Heartfield produce the self-portrait at this juncture and not any other? What does the picture tell us about his political subjectivity? Which cultural discourses made Heartfield's intervention possible, even determining the decibel level of its strident tone? How might a leftist audience have received the image? To answer these questions is to recuperate what Hans Robert Jauss has called the "horizon of expectation," or the set of cultural, political, and aesthetic expectations that the viewers of the image in 1929 might have held.2 In weaving the self-portrait into various discursive contexts, from the intricate politics of late 1920s Communist subjectivity to the semiotics of pictorial rupture, I aim to anchor its various ideological and visual operations within the particularities of a specific historical moment. Like a motif in a fugue, the self-portrait repeatedly resurfaces throughout this chapter's argument, its significance becoming more complex and resonant as I unpack the conditions of its production. John Heartfield's 1929 image is one of the rare instances of self-portraiture in the artist's body of work. As such, it is an uncommon venue for his self-representational "voice"-a self-constructed utterance about himself and his artistic project at a particular moment. Even more remarkably, this emphatic statement was designed for a well-established mass-circulation journal of the Left. In contrast to earlier Dadaist self-portraits disseminated in short-lived artists' magazines with small print runs, this picture makes a declarative, public statement on a large scale. With an ambition for popular appeal never to be matched, this unique instance of Heartfield's artistic performance represents both the apex and the finale of a Dada theatricality gone resolutely political, for in subsequent AIZ works his embodied authorship is supplanted by his adroit photomontage, while his name retreats from the title to an occasionally ironic byline. Such was Herzfelde's dominion over the Heartfield legacy that other firsthand accounts of the photomonteur and his work met with his derisive pen. For instance, Herzfelde's copy of Roland März's impressive Der Schnitt entlang der Zeit, an invaluable compilation of documents, testimonials, and essays about John Heartfield, is assertively reclaimed by the marks of Herzfelde's hand.7 Scribbled notations such as "imprecise," "wrong," or "quatsch" (the last more or less translatable as "nonsense") deface the margins. A stamp bearing the name MALIK-ARCHIV brands the inside cover, as if Herzfelde wanted to take possession, in ink, of these printed words published outside his jurisdiction. A typewritten disclaimer cut and pasted inside indignantly declares to all readers and posterity that the book appeared without his knowledge and collaboration. Clearly Herzfelde, anticipating an archival reception of his legacy, asserted his hagiographic primacy over John Heartfield from beyond the grave. Heartfield's choleric temperament evolved beyond a mere personality trait into an artistic legend cited regularly as a driving force for his art. "No, our Jonny [sic] had only one thing: a heavy heart that reacted with immense intensity to every adverse, unjust, sinister and degrading manifestation of our society," wrote Oskar Maria Graf in 1938.13 "Produktiver Jähzorn" Herzfelde called it, naming a kind of creative fury-a descriptive term that Heartfield would later wield himself, embedding this evocative phrase in the dissemination of his legacy.14 Characterizing impulsive irascibility as a productive vehicle for dissent deftly converts the story of personal torment into one of political benefit, advancing the Communist cause with passionate investment. 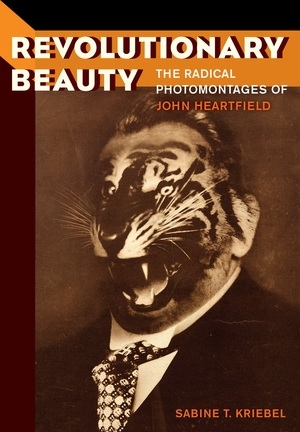 Similarly, Canetti's not entirely sympathetic appraisal of John Heartfield (perhaps reflecting Canetti's lingering wound from Heartfield's having once called him a termite) suggests that the artist's volatility and his montages amounted to the same thing: "His reactions were so spontaneous that they got the better of him. He was skinny and very short, and if an idea struck him, he would leap into the air. He uttered his sentences vehemently as if attacking you with his leap. . . . [H]e could only learn aggressively; and I believe one could show that this is the secret of his montages. He brought things together, confronted things after first leaping up at them, and the tension of these leaps is preserved in his montages. "15 Brigid Doherty, in a comparable argument, links Heartfield's explosive vehemence to a larger discourse of war neurosis and, in turn, to the technique of Dada montage. "Montage, then, is a vehicle for the monteur's traumatophilia," Doherty writes; "it is a technique for the materialization of traumatic shock. "16 In this chapter, I suggest that Heartfield thematizes the productivity of hate in his late Weimar photomontages, summoning the fuel for his pugnacious creativity from the volatile and violent political street culture of the fated democratic republic, aided by private fury. Heartfield's very name, like his self-portrait, relies on an audacious politics of protest, signaling the fabrication of an artistic identity prompted by historical and political circumstance rather than motivated by psychological necessity. "John Heartfield" came into being in 1916, as the story has it, as the pseudonym of the man baptized Helmut Herzfeld in Berlin in 1891. Anglicizing his German name in the midst of the First World War signaled a cheeky rejection of what has been called a "spontaneous and irrational" Anglophobia that took hold of Germany shortly after the English entered the war on August 4, 1914.17 Ernst Lissauer's popular song "Hassgesang gegen England" (Hymn of Hate against England) lent the jingoism a catchy rhythm and tight rhyme, igniting zealous hatred "like a bomb in a munitions depot," as the writer Stefan Zweig characterized it.18 "Gott strafe England!" (God punish England!) became a popular street greeting, to be met with an enthusiastic "Er strafe es!" (He punishes it!). The phrase was printed on mugs, handkerchiefs, pocketknives, buttons, and badges; it was rubber-stamped on letters, printed on millions of postcards, and engraved on scarf pins, cufflinks, brooches, and wedding rings.19 Swiss authorities eventually issued a warning that letters from Germany bearing the imprint "Gott strafe England!" would no longer be handled by the Swiss post office.20 Its omnipresence signals the nationalistic mania that seized Germany, one of the manifestations of the so-called Spirit of 1914, the collective experience of war mobilization expected to unite the German nation in the present and in the future.21 Adopting the Anglophile name "John Heartfield" indicated Helmut Herzfeld's internationalist, anti-militarist convictions in no uncertain terms; in so doing, he provoked his countrymen by openly taking sides with the enemy during a period of virulent nationalism. That he continued to sign personal letters "Helmut Herzfeld" in December 1917, long after the asserted date of 1916, suggests that this transformation occurred erratically and intermittently rather than emphatically as the established Heartfield narrative suggests. This change in designation would parallel those of his closest collaborators, who also amended their names but to lesser degree. Georg Groß became George Grosz, fusing his Anglocentric interest with his Slavophilia, while Heartfield's brother Wieland Herzfelde made alterations for what he considered poetic rather than political reasons, appending a final e to his father's blunt surname. At the close of the war, John Heartfield, along with his brother, George Grosz, and the playwright Erwin Piscator (all of whom would later collaborate with Heartfield), signed up with the fledgling Kommunistische Partei Deutschlands (KPD). According to the brothers' recollection, they did so at its founding party congress on December 30, 1918, receiving the Parteibuch (a booklet confirming Party membership) from Rosa Luxemburg herself-a neatly packaged story that resurfaces repeatedly. This account has come under closer examination, however, spurred by the fact that the Party congress only began on December 30, lasting until January 1, 1919, in the midst of widespread political turbulence; a published and distributable Parteibuch was hardly likely.22 The anecdote was most likely fabricated retrospectively in the early 1950s to shore up the brothers' Communist loyalty in face of stern Party scrutiny, though Heartfield's early allegiance to the KPD remains unassailable. His subsequent involvement with Berlin Dada, whose art offered a tactical riposte to the traumatic war and the failed revolution of 1918-19, was an anti-bourgeois, pro-revolutionary protest that wielded photomontage as a critical weapon, to portray the first German democracy, the Weimar Republic, as a disorderly verbal-visual cacophony (fig. 6). It is in this context that Monteur Dada (as Heartfield was called) took to wearing his blue overalls (a Monteuranzug in German) in alliance with the industrial laborer. While the radical proclivities of his fellow Dadaists, including George Grosz, waned in the mid-1920s, Heartfield remained a dedicated agitator for the Communist cause, designing election posters, book jackets, and beginning in 1929, satirical photomontages for the AIZ. In his 1929 self-portrait, Heartfield's arresting gaze out at the viewer, away from his activity of bloodless violence, declares its self-conscious performativity. In the instant it was captured, Heartfield's look acknowledged the camera that froze it for posterity, his eyes directly confronting the lens. In its conception, however, the gaze was intended for the viewers beyond the camera, challenging an imaginary audience to witness an execution that the photographic moment can only foresee. This declarative look insists upon a moment of caesura, a pause separating the act of summoning and the act of construction (or destruction), and indicating to us that the photomontage is equally about an alliance with the viewer in which we are made complicit, as captive to Heartfield's handiwork as Zörgiebel. Heartfield is not merely aware of his audience, but deliberately enjoins it, sparking a preternatural continuity between this static photographic likeness and the viewer. We are momentarily sutured as accomplices to this violent act, his penetrating look, in startling contrast to Zörgiebel's lifeless features, demanding that we respond. This visual summoning is a metaphor for Heartfield's subsequent project for the AIZ, a working relationship that was to endure nine years, survive forced exile, and generate at least 237 photomontages.23 Like the self-portrait, Heartfield's photomontages labored to stimulate political consciousness through aggressive visual means; their aim was to seize the passing gaze in a visual economy saturated by the photograph, hailing viewers into place while transforming us into critical subjects enlightened by a Communist perspective. The ultimate goal was to create a community of revolutionary-minded citizens who would actively contribute to radical social change. The beholder of the photomontage completes the work, an action that is, as I argue, a cognitive operation woven into the conception of Heartfield's project. Heartfield's viewership would largely have invested in the position he advanced. The AIZ was an overtly political alternative to the illustrated magazines flooding the German market in the mid-1920s. Aligned with, but not an organ of, the German Communist Party, the AIZ was subordinate instead to the Communist International in Moscow, or Comintern. Based on the notion that, as its publisher Willi Münzenberg later phrased it, "an illustrated magazine is more entertaining than a lead article in a political daily," the AIZ boasted a weekly print run of 500,000 by 1931, according to its own estimates.24 It was one of the most popular illustrated magazines in circulation, though its distribution was well behind that of the left-of-center Berliner Illustrirte Zeitung (BIZ), whose readership extended into the millions.25 Geared toward a broad-based left-wing readership, the AIZ had as its purpose to propagate a Communist point of view to non-Party members and the so-called homeless Left by capitalizing upon the potential of modern mass media to generate a heterotopic alternative space. Its brilliance lay in its ability to speak to the broad spectrum of Lefts during the Weimar Republic, many of which felt disenfranchised by both the radical KPD and the more moderate Socialist Party (Sozialistische Partei Deutschlands, or SPD). For instance, both Tucholsky and the artist Käthe Kollwitz contributed regularly, disagreeing with the intransigent stance of the KPD but nevertheless supporting radical left-wing politics on philosophical grounds. The diverse readership of the AIZ can be inferred from photographic materials. An amateur photograph, circa 1930, captures three young women, their hair stylishly bobbed in the Bubikopfschnitt, sitting on the ledge of the Bauhaus canteen terrace, drinking in the weak sunlight (fig. 10). One of them reads the AIZ. This snapshot of Bauhaus life provides markers of a leisured, educated, modern, urban, leftist Weimar Republic. Contrast this with the cultural codes propagated by a kaleidoscopic photomontage published in the pages of the AIZ itself in October 1931 (fig. 11). Cows and Lederhosen in the upper left inform us that the southern agrarian sector reads the AIZ; a barefoot boy in the upper right, his pale naked feet vulnerable against the cobblestones, lets us know that impoverished urban working-class people read the AIZ; men in stereotypically proletarian caps with pipes tell us that the skilled worker reads the AIZ. Another laborer, his dirty, rough hands resting on a grubby kitchen table, sits nearby, reading the AIZ with a child at his side, the girl incongruously presented in a starched pinafore and hair bow, perhaps a projection of a less taxing future. A dark-complected girl placed prominently in front signifies the AIZ's reach into the Far East. In case the assembly of staged photographs does not make their collectivist, international message abundantly clear, explanatory text in the lower right-hand corner elaborates. Two very different images, two very different meanings: the latter, a self-consciously constructed image, was designed to signify within the sphere of the paper's circulation, while the former was a serendipitous portrait of an AIZ readership. The medium of montage produces the sensation of an intimately clustered reading community, as opposed to the individualized consumption conveyed in the Bauhaus photograph. Although some people might read alone-the man convalescing in the center of the image, for instance-the busy juxtaposition of photographs insists that atomized readers are nonetheless part of a diverse community whose members know no dividing walls. The communal ethos encouraged by the AIZ derived directly from its basic objective: to reinforce Communist political unity and cohesion by way of an illustrated journal. The AIZ also sponsored book readings, film evenings, lecture series, events for women and children, summer festivals, and sports clubs. Regularly solicited for input, readers were summoned by a "personalized" handwritten script and addressed with the informal "you" (Du). The AIZ evolved out of an international aid campaign for the famine victims of postrevolutionary Russia, established by Münzenberg in 1921 at V. I. Lenin's behest. Its umbrella organization was the Internationale Arbeiterhilfe (IAH), or International Worker's Aid, for which Münzenberg served as general secretary. To support the IAH, Münzenberg published the monthly journal Sowjetrussland im Bild (Soviet Russia in Pictures), which was renamed Sichel und Hammer (Hammer and Sickle) in 1922.26 The Arbeiter Illustrierte Zeitung emerged out of Sichel und Hammer in 1925, at first appearing monthly, then every fourteen days, and then, in 1926, weekly. The AIZ reached its readership by way of newsstands, local bookstores, and a posse of Kolporteure, the journal's "shock brigade." Such militarist references were used in the AIZ literature itself, as these troops not only distributed the paper but also functioned as the offensive front line, as agitators and discussants in the streets and on doorsteps.27 Although many newspapers were sold by street hawkers during the Weimar Republic, those who sold the AIZ took on special significance. These Kolporteure were an integral part of the politicized AIZ community, often photographed within its pages; they received a complimentary propaganda pamphlet, Der AIZ Kolporteur, weekly, as well as prizes for AIZ sales, ranging from books to trips to the Soviet Union.28 Just as the Kolporteure circumvented the difficulty of selling the AIZ from the numerous newspaper kiosks owned by Alfred Hugenberg's right-wing media cartel, readers themselves were recruited for distribution and encouraged to pass the journal along-to leave it on park benches, buses, in cafés, for the neighbor, for the milkman-thereby expanding the leftist community and liberally circulating its revolutionary message in the public sphere (fig. 12).29 The journal was thus a political vehicle, wielded strategically and cultivating the invested intersubjectivity distilled in Heartfield's self-portrait. The readers of the AIZ would have delighted in Heartfield's staged fantasy of beheading Police Chief Zörgiebel. Zörgiebel, a Social Democrat, was the figure held accountable for the unprecedented police violence against the Communist demonstrators on May Day 1929, soon dubbed Blutmai, or Bloody May, by the radical Left. Five months earlier, in December 1928, Zörgiebel had prohibited all outdoor meetings and demonstrations in order to crack down on the increasing number of violent street clashes between and among Communists, Socialists, and National Socialists. He then extended the prohibition to include the May Day marches, a highly symbolic annual tradition, for both Socialists and Communists, that demonstrated working-class pride and solidarity. The Communists, taking this gesture as (another) provocation by the regime, appeared en masse to peaceably protest Zörgiebel's prohibition, only to be met by specially drafted riot police. Holding rubber truncheons and pistols, they were armed and psychologically primed to disperse the crowds.30 Toward evening, as the legal indoor meetings disbanded, the numbers on the streets grew, and police clashed with crowds throughout the city. Dozens were arrested simply because they were on the wrong side of the street or as they attempted to flee an onslaught of bullets; others were beaten on sidewalks, in police vans, or at station-houses; still others were shot because they happened to be on their balconies or on an evening stroll.31 Shocking exposés later revealed unwarranted police violence against disabled war veterans, hapless passersby, and innocent children. In the following days, the police placed entire districts of working-class Berlin under martial law. They mobilized carbines, personnel carriers, and armored cars, at times directing their fire at house fronts, to breach the barricades repeatedly constructed to hinder their progress. The police troops also embarked on large-scale search-and-arrest missions, covering entire streets of apartment blocks. Over thirty civilians were killed, more than half of them innocent bystanders.32 Further casualties included two hundred wounded, more than twelve hundred arrested, and forty-four imprisoned. Accounts of police excesses, in part propagated by the KPD itself, provoked mass demonstrations in Berlin and other Communist centers throughout Germany. Blutmaiproved to be a turning point for both German working-class consciousness and the KPD, further polarizing the political landscape of the late Weimar Republic.38 The events appeared only to confirm the theory of "social fascism" promoted by Stalin and the Communist International. This theory held that the Socialists were increasingly subject to fascist politics, though "fascism" included anything more moderate than radical Communism-a Communism turned even more radical after the Sixth Congress of the Comintern in the summer of 1928.39 The Sixth Congress declared a new historical period in postwar social development. At the core of this declaration was the observation that postwar world capitalism had entered a "Third Period," which was riddled with political instability and economic crises. (The first period was marked by postwar revolutionary activity; the second was the relative capitalist stabilization of the mid-1920s.) Increased class conflict would result, thus opening the possibility for proletarian revolution. Standing in the way of the revolutionary proletariat, according to this logic, were the reformist Socialists who, in Germany at least, formed governing coalitions with more conservative parties, aligning themselves with the forces of order and tradition rather than advancing radical progress for the laboring class. Enter John Heartfield, scissors in one hand, scalp of Zörgiebel in the other, on the page 17 of a mass-circulation illustrated magazine answerable to the Comintern. Although the KPD press was repeatedly banned during the Weimar Republic, the AIZ was never subject to that same censorship.43 Heartfield's photomontage not only gives the social fascist a face but also thematizes the fight against him; Zörgiebel the victimizer becomes the victim. In the form of popular politics, the righteous photomonteur John Heartfield, fierce gaze burning, brow scrunched in concentrated fury, scissors in hand, dispenses justice on behalf of the radical Left, avenging those who are dead, injured, imprisoned, or politically dispossessed because of SPD politics, in a payoff for Bloody May 1929. The popular iconography of the French Revolution-the guillotine as the people's avenger-is transmuted into the everyday weapon of the political montage artist. Like much Communist propaganda, Heartfield's image was a "politics on the ground," indicative of a brand of activism designed to circulate on the streets and to speak to ordinary citizens. Heartfield's protest was not merely performative, safely relegated to paper, scissors, and glue and furtively sequestered in the inside pages of a leftist magazine, but regularly occurred on the front lines. In the days following the May Day riots, hetook it upon himself to witness the events in the barricaded sections; "I needed it for my work," he would stutter in explanation afterward, since he was, to quote his colleague Max Gebhard, "unable to speak out of agitation. "44 A short time later, Heartfield's activism prompted a bloody pummeling, dealt him by a bellicose "Teuton the size of a tree. "45 The tree-sized German, according to the tale, applauded while watching newsreels of the violent excesses of the Zörgiebel police during a showing of the Wochenschau at the Ufa-Palast. Heartfield sprang up "as if he had been bitten by a tarantula," as his colleague would later word it, and hissed at the antagonist, "You pig! You pig! You pig!" (Sie Schwein! Sie Schwein! Sie Schwein!). Confronted at the end of the show, Heartfield refused to take back his insults, instead redoubling his efforts, only to be beaten bloody on the sidewalk until rescued by passersby. Years later, a few weeks into the Nazi regime, Heartfield's proclivity for confrontation ended fortunately in retreat rather than what could have become a dangerous dispute. One evening, Heartfield had joined a group outside a café after a meeting with other artists of the Communist Bund Revolutionäre Künstler when a Nazi Schutzpolizist, or "Schupo," advanced on the group and ordered them to disperse.46 "Gehen Sie auseinander!" he is said to have shouted. Heartfield, head down, stormed forward and said: "You! Listen! You have a Tschako on your head, and I only have a cap! But underneath my cap is more good sense than under your helmet!" Heartfield's response provoked such a bewildered shock in the patrolling officer that he simply turned on his heel and hurried off without another word. Revolutionary Beauty offers the first sustained study of the German artist John Heartfield's groundbreaking political photomontages, published in the left-wing weekly Arbeiter Illustrierte Zeitung (AIZ) during the 1930s. Sabine T. Kriebel foregrounds the critical artistic practices with which Heartfield directly confronted the turbulent, ideologically charged currents of interwar Europe, exposing the cultural politics of the crucial historical moment that witnessed the consolidation of National Socialism. In this period of radicalization and mass mobilization, the medium of photomontage—the cut-and-paste assemblage of photograph and text—offered a way to deconstruct the visual world and galvanize beholders on a mass scale. Kriebel transforms our understandings of montage as a quintessentially modern practice. Central to that reconceptualization is suture, a concept integral to film theory but recruited in this book to explore the psychic operations of Heartfield’s seamlessly welded AIZ photomontages. Revolutionary Beauty proposes that the language of sutured illusionism constitutes one of the most important and overlooked critiques of modern media, wherein a radical reassessment resides in suture. Scholars of photography, modern and contemporary art history, media studies, and European history will doubtlessly embrace this book. Sabine Kriebel is Lecturer (permanent), Modern and Contemporary Art, at University College Cork, Republic of Ireland. She completed her PhD in 2003 at UC Berkeley.